What is this all about? Howard Street is a street located in the Babcock neighborhood of the East Side between Jefferson Street and New Babcock Street, running parallel to Clinton and William Streets. The street is named for Major General Rufus Lombard Howard, the man who put the world’s first successful mowing machine on the market. Rufus Lombard Howard was born in Litchfield, Herkimer County, on October 30th, 1818. He attended schools there until he was 15. He then became a clerk in the Country Store in Schuyler. From 1836-1837, he served as Assistant Postmaster at Frankfort. He came to Buffalo in 1839 as a clerk to H.C. Atwater, grocers and ship-chandlers. During the Cholera Epidemic in Buffalo, Mr. Howard went to stay Batavia. While in Batavia, he met William Ketchum. Mr. Ketchum had invented a machine. Mr. Howard made suggestions to him, and together they perfected the mower in 1851. 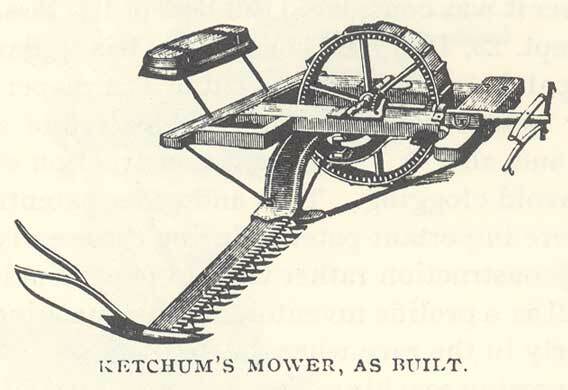 Mr. Howard invested the capital necessary to produce the Ketchum Machine. The machine was manufactured at the Howard Iron Works at 281 Chicago Street. Howard Iron Works was known as one of the largest and best known general machinery and foundry works of its time. By 1859, nearly 20,000 of the mowing machines had been sold. Howard Iron Works was bought by J.D. Cousins and Sons in 1904, which became J.D. Cousins in 1967. The company is still in business today, more than 160 years later, on Tifft Street! In 1851, Mr. Howard also became connected with the 8th Division, National Guard of the State of New York (NGSNY) as aide-de-camp, with the rank of Major. He was made an inspector and promoted to the rank of Colonel. In 1865, he was selected to by the Governor as General. During this time, the 65th and 74th regiments were housed together in the State Arsenal, which was crammed. He appropriated money to purchase a lot and build an armory, the Fremont Place Armory (Fremont Place was part of what is now known as Elmwood Avenue). The Armory was replaced by the Armory located on Connecticut Street in 1894 due to a growing size. The Fremont Place Armory was located approximately where the Family Dollar is now located at Elmwood Avenue and Virgina Street. General Howard accompanied Governor Hoffman and his staff in laying the corner-stone of the State Asylum for the Insane at Buffalo (now known as the Richardson-Olmsted Complex). He also was part of the unveiling of the statue of General Bidwell. General Howard retired in 1878. During his military command, many distinguished guests were entertained at his residences, including three Governors of New York – Fenton, Hoffman and Dix. General Howard’s interests also included agriculture, which he considered his favorite recreational activity. He purchased 200 acres in the 13th Ward of Buffalo, which was known as Sander’s Farm. At the time, this part of the city was wilderness. To clear this land for agricultural purposes, he hired over 200 unemployed men, of which there were many due to the panic of 1857. The farm was located on Tifft Street, across the railroad tracks from George Tifft’s operations. General Howard also purchased 350 acres near the lake shore in the Town of Hamburg, between Big Tree Road and Howard Road, where he built his country home, known as Meadow Farm. Meadow Farm was the first to have Jersey cattle in Western New York. He served on the board of the Erie County Fair Association, and exhibited from his farm at the fair. In 1891, General Howard decided to discontinue horse breeding, as the land on his farm in South Buffalo had become too valuable. In March of that year, General Howard sold his stock of horses, bringing in good prices, including a reported $15,000 for one horse! The farm was developed by railroads to serve the Donna Hanna Furnace Company and Republic Steel. General Howard married Maria Field in 1842. Five of the Howard’s six children died in childhood. The sixth child, Gibson Field Howard, died in his early 30s. This encouraged General Howard toward the betterment of youth, and his contributions to the Young Men’s Association, of which he was the first president. General Howard served on the building committee of Trinity Episcopal Church, helping build things for the church through Howard Iron Works. General Howard and his wife donated one of the stained glass windows in honor of one of their daughters. When not at their farms, General and Mrs. Howard lived at 247 Delaware Avenue. He died on June 28, 1896 and is buried in Forest Lawn Cemetery. To learn about other streets, check out the Street Index. 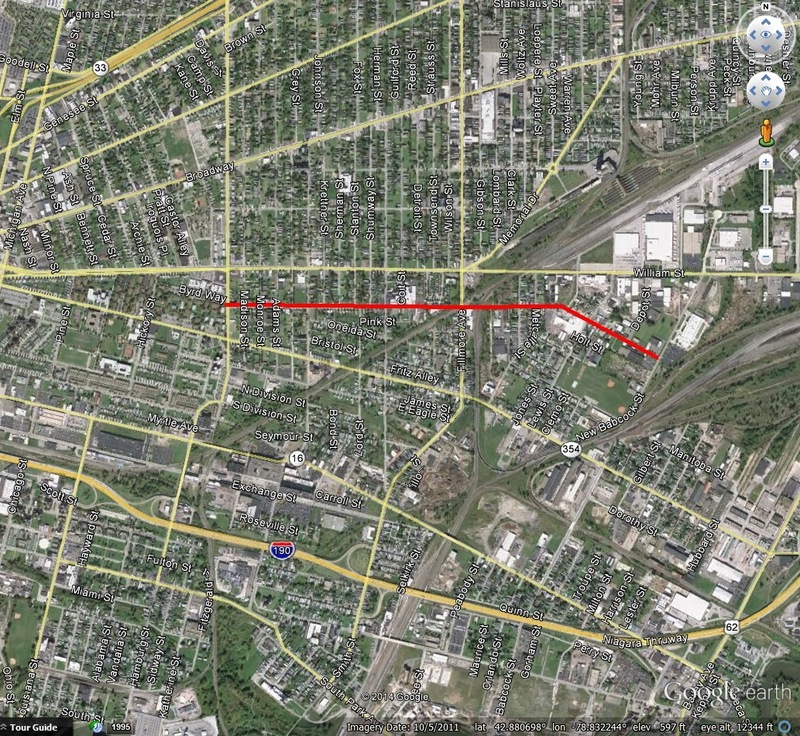 Manufacturing Interests of the City of Buffalo. Second Edition. Published by C.F.S. Thomas. Buffalo, 1866. Contemporary American Biography: Biographical Sketches of Representative Men of the Day. Atlantic Publishing and Engraving: New York, 1895. National Cooper’s Journal. February 1911, page 16. ‘Wilkie Collins at Home”. Wallace’s Monthly. Volume XV, No. 7. September 1889. Angela Keppel is a Buffalo, NY history enthusiast and urban planner. She spent her childhood in the Grosvenor Room at the downtown library and the Buffalo History Museum. "Talking Proud" is her anthem. For more information and to contact Angela, please see the about me tab at the top of the page. A complete list of streets which have been written about can also be found at the top of the page under the Street Index tab. All content provided on this blog is for informational purposes only. The owner of this blog makes no representations as to the accuracy or completeness of any information on this site or found by following any link on this site. Any photographs displayed on the blog are for information purposes only. Attempts have been made to source to original image content wherever possible. If you own a specific image on this site and want it removed, please email me at buffalostreets (at) gmail.com and I will remove it. People, places and planning around the world by bicycle.